The company was founded by Professor Alexander Mikhailovich Feskov, M.D., a member of the European Society of Human Reproduction and Embryology (ESHRE), the American Society of Reproductive Medicine ASRM, a member of the board of the Ukrainian Association of Reproductive Medicine UARM. Since 1995 he has been working effectively in the field of reproductive medicine in Ukraine. Feskov human reproduction group performs a complex of medical, legal, information, trouble-shooter services in the field of reproductive medicine, reproductive rights, human genetics. Our technologies are the most advanced, which allows us to solve male and female reproductive problems of any complexity. In this case, the main mandatory condition for their application is reliability and safety. We use surrogate motherhood, oocyte donation , pre-implantation genetic diagnosis, cellular therapy, mitochondrial transfer and other modern reproductive techniques that allow making a child's birth possible with any forms of infertility, and also to achieve the birth of a perfectly healthy baby. We provide our customers with comfort and reliability. During the whole period of our cooperation they are surrounded by care and understanding. We work with everyone individually and take everyone's problems to heart. We have many achievements, but we do not rest on our laurels, but we strive to work even better. Our main task is a positive result in each specific case. When you come to our company, you do not just come to a good doctor. You get a full range of services. The doctor's talent, the work of service management and the skills of lawyers - everything works for results. You trust us the solution of your problems, and as a result, you embody the dream of a child in life. Our employees are top-class specialists who successfully combine practical work with the scientific one. These are candidates and doctors of medical sciences who have long been engaged in reproductive health issues. We keep our finger on the pulse of the world's medical discoveries, follow the latest research in reproductive endocrinology, we are actively involved in the scientific process and timely introduce successful medical developments. 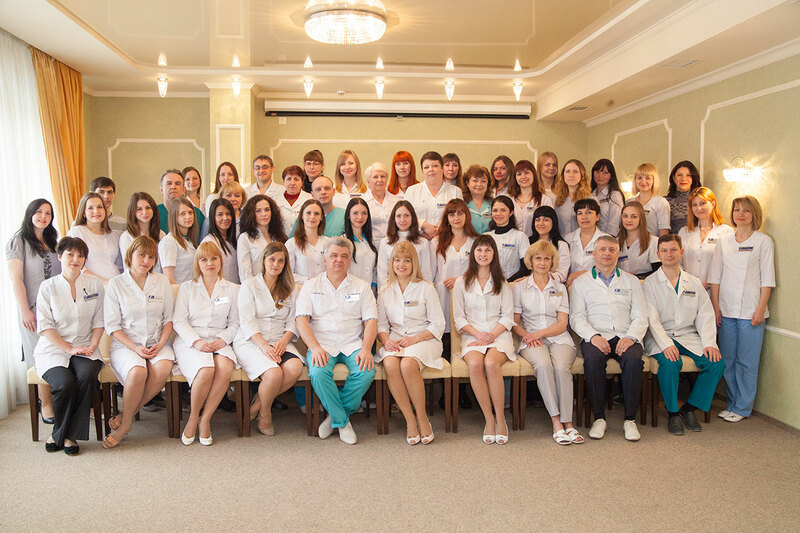 Our locations: To date, the company includes three clinics: in Kharkov, Kiev and Prague. The main office is in the city of Kharkov. Here there are 2 IVF laboratories, an operating laboratory, a genetic laboratory. In the clinics located in Prague and Kiev, we carry out medical programs, conduct initial consultations and examinations of patients. World coverage: Our partners are in the USA, Spain, Czech Republic, Germany, France, Italy and other countries (exact geolocation of partners can be learned from managers). Cooperation allows us to achieve better results and maximize the opportunities offered by the use of surrogate motherhood and other reproductive technologies so that children can appear in families with reproductive problems. In the modern world, logistics plays an important role and influences the success of an event. We took it into service, we work clearly and smoothly planning each step in advance and adjust to your wishes. Working with partners, we successfully implemented remote guarantee programs. You do not need to come to Ukraine to become our customers. Conducting the reproductive program and labors can take place in your country or another country that you choose. We always put ourselves in the patient's place and select the best program. We apply only guarantee programs that give a 100% result. The participants of WHO program in overcoming inheritance of monogenic diseases. We use the minimum of the human factor in the work of high-precision technologies. When the outcome is determined by the hand of a master (for example, when choosing a healthy sperm), we have an accurate handmade work. We cover all medical risks associated with IVF, pregnancy management. IVF Perfect human - creating a genetically perfect healthy child from your sperm and egg. Own base of egg donors, selection of a donor for genetic testing. Personal acquaintance with an egg donor. We select donors of ovules of any nationality. We find the donor who looks like as much as you. Own bank of surrogate mothers, the most effective choice and control. High-quality implementation of individually selected and masterly executed world's newest technologies at Ukrainian loyal prices and before the onset of pregnancy on a turn-key basis without additional payments. Each client has an individual approach that includes deep analysis of the situation, which allows finding a solution in each case. Payments are made officially through the bank, all major currencies of the world are used. There is a possibility of cooperation with your insurance company. We solve legal issues of any level, complexity and volume. We provide a full range of legal services right up to obtaining a passport for a child in your country. Complete in-house infrastructure: availability of own IVF and genetic laboratories, modern operating rooms. A personal coordinator is provided for each client. Multilingual staff works. Comfortable conditions in the hospital. Modern VIP-chambers, hotels and apartments, where you will feel most comfortable and cosy. It all began with a small office in which an obstetrician-gynecologist worked, Ph.D. Alexander Mikhailovich Feskov, dealing with the problems of reproduction and artificial insemination. Gradually there appeared a clinic, which today has grown into a large company. Until 2012, the clinic operated as an ordinary reproductive health center, and was focused exclusively on medical programs. All other services for surrogate motherhood programs and donation of eggs were performed by agencies. But the work of agencies was not always satisfactory and conscientious. We also wanted to provide customers with the best service in all areas of contact. Therefore, the clinic began to work exclusively with its management. To date, a lot of work has been done, a colossal experience has been acquired. As the popular Ukrainian proverb says: «A smart person learns from the mistakes of other people». Now we cover the whole range of services that relate to surrogate motherhood and our clients receive assistance in all areas of interaction: the medical, information, and legal ones. We take care of our customers, offer them the highest quality of services and provide them with guaranteed results, comfort and maximum convenience. 1995. The clinic was founded. 2000. The patent for the invention was received: «Treatment of anovulatory infertility» and «The tool for diagnosis of endometrial polyps». 2003. The first pregnancy after ICSI. 2004. The patent for the invention was received:«Treatment of endocrinological infertility». 2004. The first child was born after using embryos that had undergone cryopreservation. 2005. The first pregnancy with the use of donor eggs and surrogate motherhood. 2008. Birth of the first child after PGD diagnosis. 2010. The service «Preservation of fertility in cancer patients» was introduced. 2011. The Human Reproduction Center moved to a new building. The powerful genetic and 2 embryological laboratories joined the work. 2012. Starting the use of ART timelapse monitoring of embryos, which allows assessing the morphology and dynamics of embryo development from the very first minutes of its formation. 2013. US Patent No. 61 / 629,651 entitled «Method of stabilized reproduction for treatment of reduced fertility women with irregularity of the immune reaction» was received. Artificial window of implantation. 2014. A technique for improving the implantation of embryos using mononuclear blood cells, which increases the likelihood of pregnancy in cryoprotocols, as well as in women over 37 years old, was developed and introduced. 2014. Starting the use of the technique of searching and isolating spermatozoa from testicular tissue fragments obtained with microTESE. 2015. First pregnancy by double vitrification method. Widely used are the newest PGD methods using DNA microarrays, a-CGH, Karyomapping, q-PCR to detect embryo karyotype anomalies even before it is implanted into the woman's uterus. 2015. The first birth in the Czech Republic. 2016. A method of NGS (next generation sequencing) was introduced, which allows to detect small structural chromosomal abnormalities of the embryo and exclude the phenomenon of mosaicism at the stage of development of the embryo of 5-6 days of development. 2016. The first birth in America. 2016. First birth in Canada. 2017. Opening of a branch in Kiev.